Demon Gaze II - The Art of Dating Demons & DLC Announcement! | NIS America, Inc.
Home / Blog / Demon Gaze II - The Art of Dating Demons & DLC Announcement! What are the benefits of dating demons? Glad you asked! While this game is filled with intense role-playing action, dating demons is also an integral part of giving yourself every advantage in the fight against Magnastar and his evil demonic army. 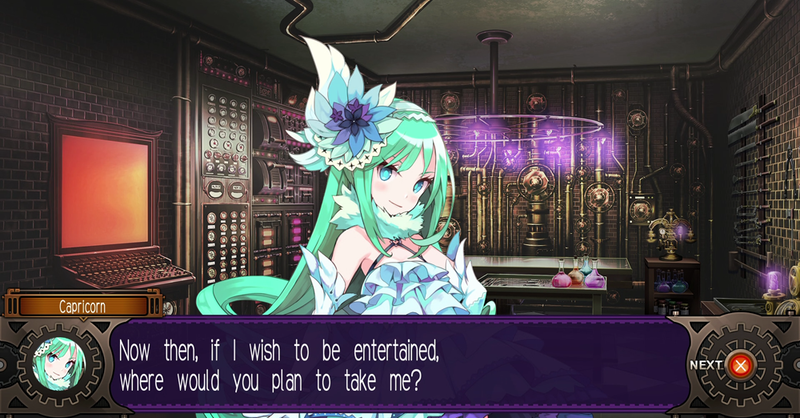 Demon Gaze II allows players to get to know the real demons you recruit into your party. Sometimes in long sprints of grinding, it’s nice to head back to Stella’s Place to just hang out with your demon party members. And as you make your way through the game, you’ll collect items called “Maintenance Crystals,” which allow you to participate in The Maintenance Game with a demon of your choice. The purpose of The Maintenance Game is to deepen your relationship with the demon and increase your level of “Likability” with them. There are 5 levels of Likability, which unlock beneficial demon powers. Canis and his Demon Skills! Every time you reach the next level of Likability, an exclamation point will show up next to a demon’s name, signifying your chance to date ‘em. With plenty of demons to date, you’re sure to find the match of your dreams! The Sweet Spot is the spot where all demons find...sweet. The Maintenance Game is split into two parts, Practice Time and Maintenance Time. During Practice Time, the player has 5 practice tries to find the Sweet Spot on the demon. You’ll get 3 possibilities when trying to find the Sweet Spot: Poor, Good, and Perfect. Aim for the “Perfect” for the highest amount of experience points to increase a demon’s Likability. And just because you find a demon's Sweet Spot the first time, it won't mean that you'll find it the second time! Sweet Spots will never be in the same spot, so keep that in mind! Let's take a look at one of the demons, Cygnus, as an example! I found the Sweet Spot! Once you get an exclamation point next to a demon’s name, you can start dating ‘em! Each demon has their own unique personality, which is the most fun part of this whole demon-dating experience. Do you like a demon that's more into extravagance *ahem Capricorn* or a demon that simply enjoys the pleasures of binge eating *ahem Leo*. The choice is yours! However, I highly suggest looking into your team's composition and figuring out which special demon skill you'd like to add to your arsenal. BUT, if you just want to get to know the demons, you might as well date 'em all. Doesn't hurt, right? Meet Capricorn. A sassy demon with extravagant needs. Hmm, this could be good? Woof. Maybe she'll like my personality. Let’s take a look at another example. And this time, with the lovely Canis! And there you have it! A very quick rundown on dating demons in Demon Gaze II. And last, but not least, we have several DLC to announce! The DLC below will be available in North America on November 21 and in Europe & Oceania regions on November 24. Whether you are in it for the dungeon crawling, monster slaying, loot grabbing or even demon dating, we hope you’ll enjoy Demon Gaze II, coming to PlayStation®4 and PlayStation®Vita on November 14 in North America and November 17 in Europe.